"For most of its time, it was a solution looking for a problem," says Larry Weber (BSEE '69, MSEE '71, PhD '75) of the technology he has dedicated his professional life to. Today that "solution"—the amazing plasma display panel, invented at the University of Illinois in 1964—seems to have finally found the problem (not to mention the goldmine) it always deserved: carrying high-definition television (HDTV) into millions of homes. 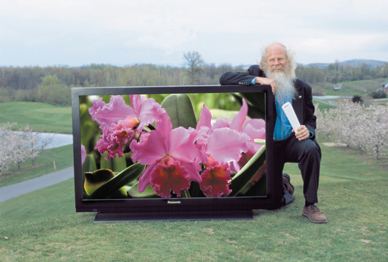 Weber's 60-inch plasma display, a prototype he developed for Matsushita (bearing the Panasonic label), combines the large size and superb resolution necessary for HDTV with the convenience of thinness. You can even hang it on your wall. In fact, one of these marvels hangs on the wall of Weber's upstate New York company, Plasmaco, an R & D arm of Matsushita. When you see it, you'll know why the Society for Information Display gave Weber its highest award in 2000 for his contributions to plasma displays. And you'll begin to understand why the TV industry gave a 2002 Emmy award for technological achievement to the original U of I inventors of the plasma display: Weber's old teachers Donald Bitzer (BSEE '55, MSEE '56, PhD '60) and the late Gene Slottow (PhD '64), and their first graduate student, Robert Willson (PhD '66), whose name appears alongside those of Bitzer and Slottow on the original plasma display patent. Fujitsu, the leading manufacturer of plasma displays, also shared the award. Weber, Fujitsu, and others are now clearing the final hurdle that separates plasma displays from long-term commercial viability: cost. With low-end models selling for about $3000—half the price of two years ago—manufacturers seem well on their way toward making plasma displays the ultimate solution to the problem of HDTV. And yet, Bitzer and Slottow had a completely different problem in mind when they created the early displays at Illinois. For them, the plasma display was part of the solution to the problem of computer-based education. What's more, U.S. TV companies who early considered plasma as an alternative to the cathode ray tube soon dropped the idea. A few computer companies stuck with plasma until another flat-panel technology, liquid crystal, seized that market. Other than that, only military contracts sustained a small plasma display industry in the U.S., and so most U of I students who worked on the technology (including Willson) eventually had to find jobs in other areas. Meanwhile Japanese engineers, whose companies dispatched them for extended visits to Bitzer's lab, went home to an electronics industry that today dominates the development and manufacture of plasma displays. What happened to the flat screen from the flatlands?